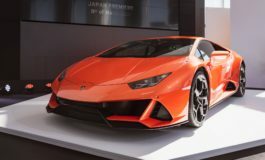 The couple of days leading up to the Tokyo Auto Salon is always an exciting time for those in in Japan’s capital to see amazing cars, in particular the night before the show. This year, I went to two meets on the night before TAS2017. The first of those was the annual RWB New Year’s meet. Okay, it doesn’t happen exactly on New Year’s Day but close enough to it. It’s basically a way to have RWB’s team, owners, and fans gathered in one place. Like previous years, the meeting place was a cool little car park near the Hard Rock Cafe in Roppongi, Tokyo. It’s in one of Tokyo’s most affluent areas but you wouldn’t think so given the dark, unassuming, backdrop. 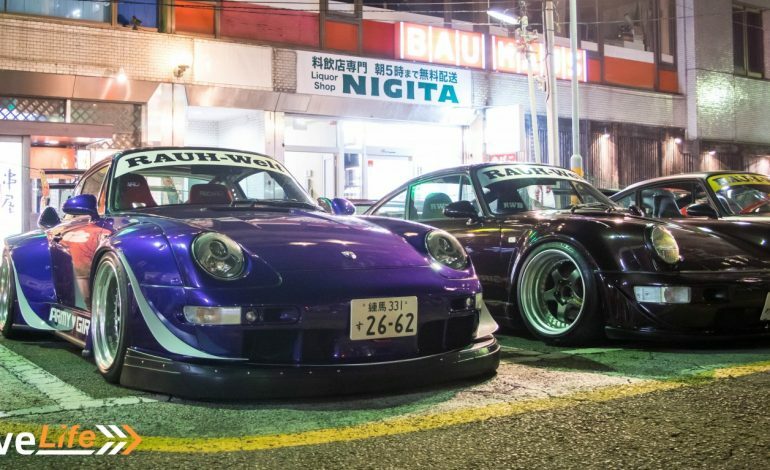 It’s rather fitting with the RWB cars though; gritty and raw. I was at the New Year’s meet last year where there were about a dozen or so RWBs. This year, there were roughly 18 widebody Porsches in attendance. Most of the cars I’ve never seen before, so it was a great treat. There were a couple of regulars such as a couple of 993s, including the purple one which was white the last time I saw it. There were a few cars we’ve seen at the RWB shop too, but other that those the majority were ‘new’ RWBs to me. 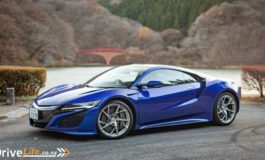 With more cars than last year meant more people too. It was surprising to see more foreigners than local Japanese fans. Most of the owners were locals but it was hard to ignore the sea of foreigners. Most were probably media in town to cover TAS, but I couldn’t help but wonder why more Japanese fans don’t come to these meets. 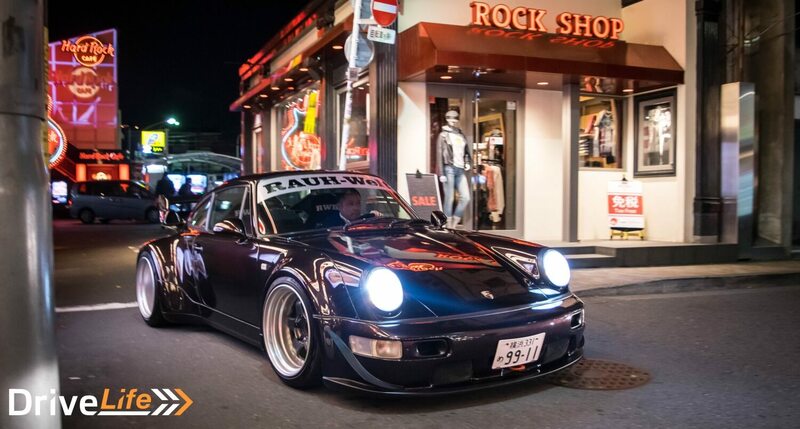 It’s not like RWB kept the meet a secret. Regardless, over two hours more cars showed up. The car park eventually became full of low, wide, and colourful cars. The crowd dispersed to have dinner, which gave us the perfect chance to admire the cars without a hundred people in the way. I’ll never tire of seeing these race-ready machines out and about. It’s not often we see them on the road in central Tokyo. 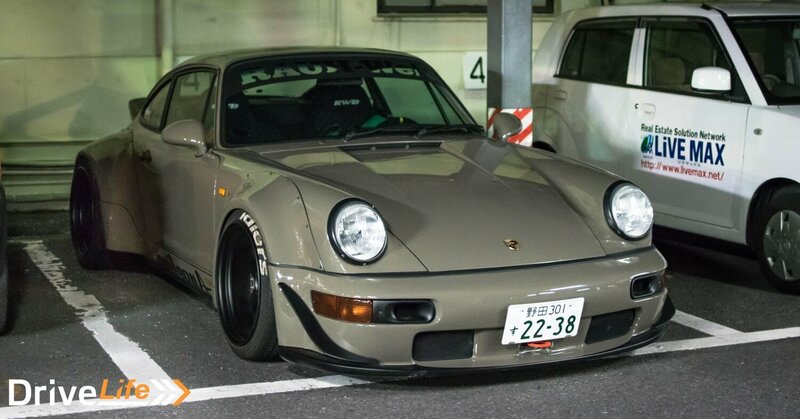 A particular standout was the black 993 with Euro-style NZ plates behind its Japanese front plate. It was quite random and I would’ve loved to see what the NZ plate said so I could run it on Carjam. The yellow 963, mint 993, and grey 964 were also rather lovely but my favourite was the brownish-grey 964 tucked away in the covered parking. I liked the colour but I especially liked the ducktail. We were only there for a short time, just enough to see the cars come in and grab a few photos of them parked up. We could’ve stayed all night but we had to move on to the Super Street Fresh Tokyo meet in Odaiba. Stay tuned for that. 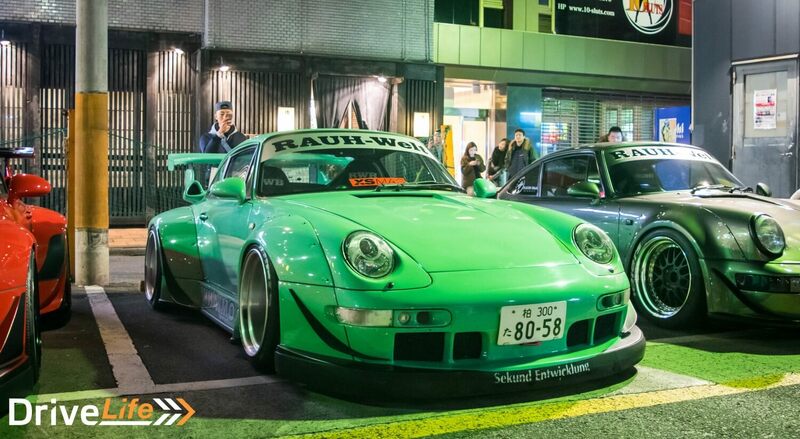 Have a look through the gallery below to see some of the highlights from the 2017 RWB meet in Tokyo. Next article 2016 Nissan Skyline 200GT-t (Infiniti Q50) - Car Review - To Infiniti Or Not To Infiniti?